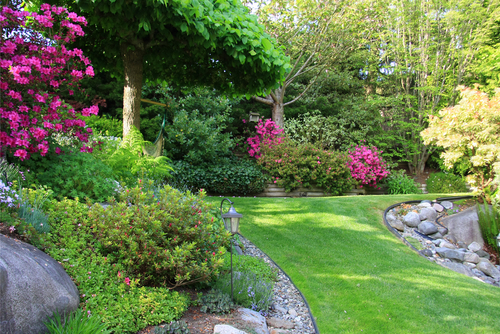 Landscaping is a great way to transform a boring weeded and overgrown back yard into a fully functional space for your entire family. If you have children who are often playing in the yard, you may think landscaping will take up their precious playing space. However, the following are some child friendly landscaping ideas that you can use, to make your back yard look beautiful but functional. There is no doubt that kids like getting their hands dirty and will love any chance they can get to play with dirt and pull up some worms from the ground. You can make part of your back yard into a small garden where your children can grow their own plants and flowers. If you do not have enough ground space, you can create hanging gardens using old boots, bottles or vases. Your kids will love getting involved in this project. You can create a play area with a sandbox in your back yard where your children can enjoy playing in the sand. Sand is safe because it provides a soft landing in case they fall. It is also easier to clean out than mud and dirt. You can lay down an old tractor tire and fill it up with sand. You can match up the beach theme with a picnic table in the patio area with a large colorful umbrella. You will need to maintain the bright and happy colors by matching them up with bright flowery plants like dandelions and carnations. If your children like to cycle then you should consider adding a cycling trail for their little bicycles and tricycles. You can use traditional paving material to make out a winding path around your back yard. The cycling trail makes it easier for them to use up more space for cycling. It also prevents them from riding on the grass and ruining it. Outdoor storage sheds are a great idea for family homes. You can use the sheds as storage space for the kid’s outdoor toys when they are not in use. You can also create a crafts workshop where your kids can get creative and messy without bringing it into the house. Outdoor sheds are quite affordable, easy to install and durable. They come in various sizes and configurations. Most of them come readily built so, it is only a matter of preparing the ground space where the shed will be set up. You can use the furthest end of the garden for this. When it comes to child friendly landscaping, one thing you cannot do without is grass. A good turf is necessary to act as a carpet for all the playful activities your children are up to. Choose a turf variety that requires low maintenance aside from a little bit of trimming and watering now and then. If you have kids in your hands, it is understandable that you may rarely get the time to handle the lawn maintenance. This entry was posted in Living and tagged design, Ideas, landscape.